Although I am English by birth for the last 20 years I have lived on the beautiful island of Lanzarote in the Canary Islands. My Canarian husband and I have 3 lovely, lively children under ten. 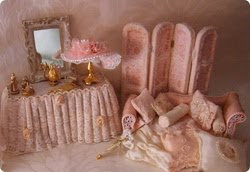 My love of dolls houses started at a very young age when my sister and I would spend hours creating scenes and houses for cardboard, paper and plastic dolls. My love of miniatures was rekindled by the gift of a dolls house kit from my parents for my 40th birthday and I soon became totally hooked on customising pieces of furniture for my house and making little accessories. I quickly realised that I would never have room in my house for all the things that I wanted to make and so decided to see if I could sell a few pieces. Before long I realised that this was what I wanted to do full time and the combination of working from home with a young family and loving every minute of my work is just a dream come true! 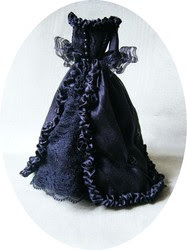 ‘Miss Amelia’ now specialises mainly in OOAK pieces of miniature millinery and dresses, many of which are reproductions of original fashion garments from all periods. Dressed beds and chaises can be made to order in a wide range of designs and fabrics. My work has been featured in several miniatures magazines both in the USA and the UK. Thanks to encouragement (and arm twisting) from one of my regular customers I have also started to customise armoires, filling them with dresses and accessories all handmade by myself.